The Self-Guided Historic walk through picturesque quarry trails features fourteen carved stone pillars topped with narrative signs identifying and describing artifacts and illuminating the history of this granite quarry, which served the Berkshire community for over one hundred years – spanning the industrial revolution. According to Dorothy Napp Schindel, Museum Director, “The narrative signs appeal to people of all ages. Featured on some signs are interactive questions for children to inspire the viewer to look for objects, describe them, and in some cases compare them to more familiar 20th century items.” The permanent exhibit historic walk will eventually contain thirty five informative posts. Among the objects on the self-guided historic walk are wooden ‘guy’ and ‘stiff arm’ derricks, grout piles (picturesque hills of jagged rock composed of the waste product of the quarrying process), bullwheels, drills, winches, a grout pan, rusted trucks, compressors, and an electrical generator shed that is thought to have been constructed from a Sears kit. The defining ‘signature piece’ of the quarry, is a reconstructed ‘guy derrick’ that looms over the quarry pit site. This derrick boasts a mast of 55′ and a boom of 50′. The mast was originally rotated on a ‘bullwheel’, measuring 10-12 feet in diameter. The reconstruction of this monumental object is being realized by a team of volunteers. The inauguration of the Historic Walk was held on the Becket Land Trust’s Annual Quarry Celebration Day, Saturday August 27, 2005. 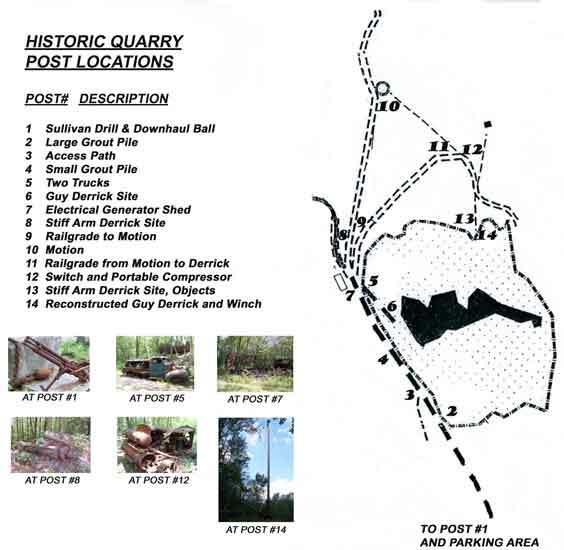 A detailed map showing both the Forest Preserve Trails and the Self-Guided Historic Quarry Walk is available at the Kiosk (located in the parking lot) and on this web site. Downloading the trail map for printing requires that you have Adobe Reader installed on your computer. If you do not have this program it is available free of charge at Adobe Acrobat software. Download Trail map in PDF format.